Dog friendly holidays and days out. Pet Holiday Finder brings you Dog friendly accommodation, cottages, lodges, hotels, b&b's, static caravan, camping sites & parks where 1 or more pets are always welcome. An online resource for everything to do with travelling with dogs; including accommodation in the UK and in Europe with Paws Abroad, safety aspects, countryside access and information. Walks for dogs and drivers within 5 miles of UK motorway exits, with dog-friendly pubs and cafes. Click here for all your pet requirements. Dog Walking Freedom – It's in the Bag! And the bag is called a Dicky bag. A tough, clever, useful little device invented by Mandy Davies a mumtrepreneur. It revolutionises the dog walk, making it a pleasure again. Whether you're using it to store your phone, wallet, keys, ball, leads or the original idea POOP you can enjoy your walk hands free, easily safely and odourlessly. Graham Thompson from Trail Magazine says "After the dog lead it is the most useful piece of dog walking gear I have. I never leave home without it." Mandy was inspired when walking the Cornish Coast with nasty plastic bags in her hand and seeing discarded plastic bags of dog poop. She designed and engineered the Dicky Bag in Cornwall and most importantly it is also hand made in Cornwall. Dicky Bags are soft and tough made out of light and robust neoprene, leak proof and machine washable. It has plenty of room inside for full bags and a Pocket for several fresh bags. The universal clip attaches to you, your dog harness, lead or rucksack. 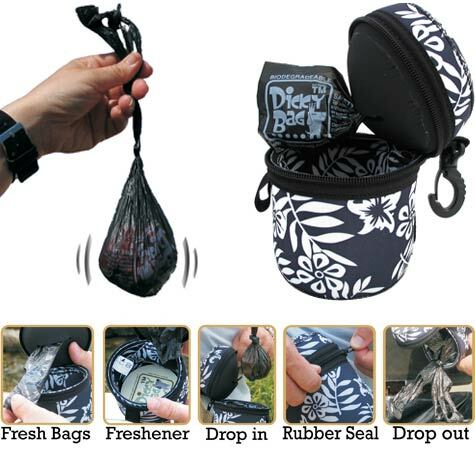 And with a unique odour prevention system with glued seams and rubber seal dog walking freedom is with the Dicky Bag. Do you know of any interesting websites we could add to our Business Directory for Pets and animals. If so, just CLICK HERE to let us know.